I lost my notes for this, our last full day in Hawaii, but the memories are still vivid so here's hoping I can make them come alive on this page. This was the only morning in Honolulu we did not have an early call so we enjoyed a leisurely start to the day. I caught up with some reading and writing and we had time to enjoy our coffee made with organic, hand picked berries roasted to medium dark at 423'F. As I type this I'm drinking the very last of the Pau Hana coffee that was given to us as a courtesy when we stayed at the Pau Hana Coffee Plantation at Captain Cook on Hawaii Island, commonly known as Big Island. This is great coffee with no bitterness whatsoever. We enjoy our coffee black so this suits us well. I am thinking of ordering some since we left it too late in our stay to get some direct from Carol while there. It's expensive but oh so good. The hotel shop was still open when we finished our late dinner the previous night so John bought an extra piece of luggage after checking it out. We had been looking around in the mall and ABC shops. This piece seemed the best buy price-wise as well as for size and convenience. It folds completely flat to store yet can expand to the size of our normal cases by unzipping two separate compartments. The smallest size is suitable to use as a cabin bag. It also has wheels and is easy to tow along. Perfect for our extra shopping. Our lazy morning gave us time to think about how we would use this piece. Once ready to leave our hotel room we wandered down the street to the Outrigger Hotel and the Shore Bird Restaurant for brunch. We were able to get a window table. Remember there is no glass and there is only the window box between the tables and the beach. We kept to our wheat-free status and had an egg based breakfast. If I remember rightly we both had hamburgers on gluten free buns. I ate less than a quarter of the bun because I simply did not need it. The most important thing is that we finished by sharing a Blue Hawaiian Cocktail so we could fulfil our promise to Sharron in Christchurch. Sharron is our daughter-in-law, Amanda's sister. We do not drink much alcohol. John likes the occasional beer especially after mowing he lawns on a hot day. Until recently I could say that my consumption would be less than a bottle of wine in a year. Here I was ordering a very boozy cocktail and it wasn't even mid-day yet. This trip has been a blast. With a little bit of time to fill in we relaxed in the cool and luxurious surroundings of the Outrigger Hotel for a while, pretending we were guests. You walk through the Hotel to get to the restaurant so it seemed to be a quite natural thing to do. Eventually we decided it was time to leave and took a leisurely stroll back to our hotel where we changed for the evening out. This was only our second evening out in the four weeks, the other being our Wedding Anniversary dinner. We are not used to night life. I guess it has something to do with always having lived a semi-rural lifestyle. I'm not going to say anything about growing older. We were out on the street again in good time to wait for the tour bus which would take us to Paradise Cove. At this time of day we had a slow trip out because of the clogged rush hour traffic but we were quite happy as there was an entertaining guide, different views from the bus and lots of interesting folk to chat with. On arrival at Paradise Cove we were greeted by friendly people and given a choice of non-alcoholic fruit cocktail or a Mai Tai. 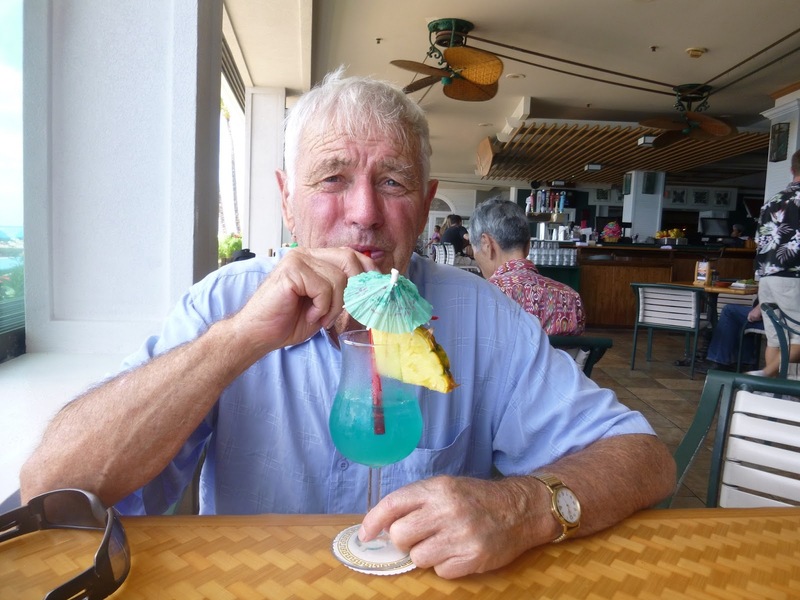 John had a MaiTai which is a traditional Hawaiian cocktail with a very distinct flavour and takes some getting used to but it packs a kick so it's not long before you forget that it is different to anything you've had before. I was more discreet after my cocktail earlier in the day. 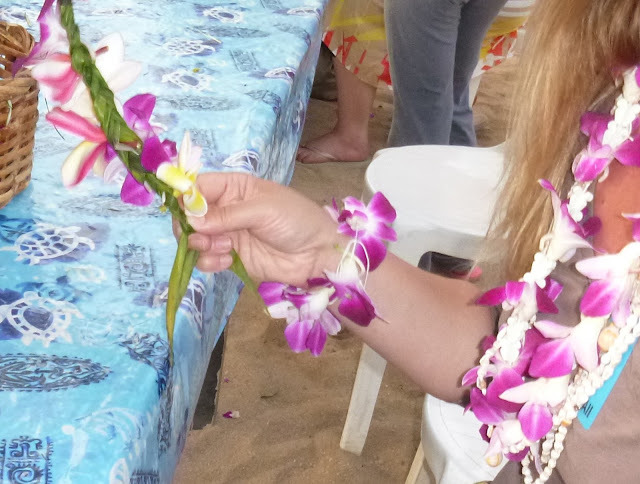 We were also given a fresh flower lei as we entered. The colour designated what area we were to sit in for dinner. Pour the ingredients in this order over shaved ice in a glass and sir with a swivel stick. Don't forget to garnish with fresh fruit and a straw and umbrella in each glass. Be glad that while these cocktails were well advertised there were also delicious alcohol free cocktails that were even more delicious. Once we had worked out the seating arrangements we went off to enjoy various activities. To be quite honest we felt a little lost at this point and it took us most of the next two hours to work out what was going on. By then it was time to find our seats for dinner. The activities included things like spear and rock throwing, both using wooden implements. We had to queue and I was pleased to score a perfect shot with my "stone" while my blunt ended spear did not even reach the target. Finally I worked out where to go to learn to make my own fresh flower lei. I strolled over to find they were closing up due to lack of light. Dark comes fast on the heels of sunset in the tropics. 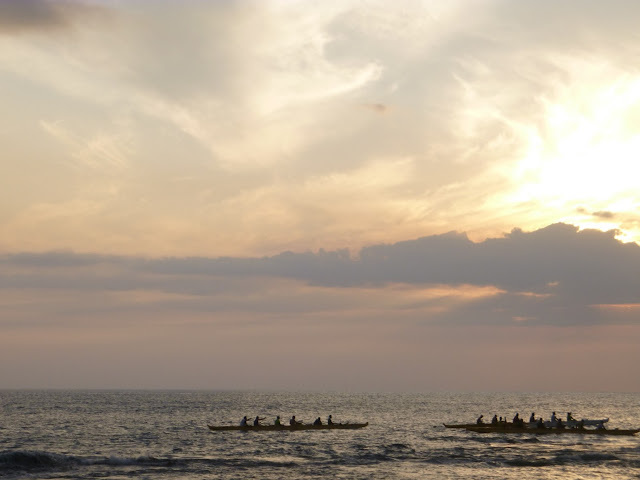 We watched some of the tourists go net fishing and canoeing as the sun set. We also watched a handsome warrior skim up the coconut palm and open a bag of fresh flower petals to rain down on guests like confetti. This apparently another charming Hawaiian tradition. The conch blew a few times and I never did understand what exactly it was for. I think it was to help us time the period we spent at each activity to give us a chance to experience them all. It was also used to tell us the bar was open for our vouchered drinks. We took one look at the queues and went to the shortest one where I got a can of lime flavoured soda and John a can of beer. Finally the conch sounded out over the water again and it was time to see the traditional blessing of the pig for the Lu'au. We took one look at the crowd and worked our way back to our table. There were nearly 1000 people including people off a cruise ship, others on a bus tour like ourselves and many individuals or groups. At our table we were alongside a large family group celebrating the father's 60th birthday. We were pipped at the post in the wedding celebration stakes by a couple celebrating their 60th anniversary. We were surrounded by people celebrating anniversaries, most on their honeymoon. I wanted to go to a Lu'au to see something of the traditional way of feasting in Hawaii. Well I missed out on a significant part. Next time I want to attend a family Lu'au. Maybe the little church we found in Hilo will indulge me. We were called to go forward to serve ourselves buffet style from a huge array of food. Again we had to run the gauntlet of starchy foods but we managed quite well. There were lettuce based salads, pasta salads like mac cheese, taro or poi, chicken, KFC style but not as tasty, raw fish salad, baked or grilled fish in sauce, pulled pork, poi bread rolls, and I'm sure I have forgotten some. To be quite honest the food was a little disappointing and I thought we paid plenty. The chicken was tasteless but the pork was delicious and I wished I'd filled my plate with pork alone. Then there were the desserts. Many were based on coconut like the coconut milk jelly we were warned could have a laxative effect if we ate too much, and various squares of this and that plus fresh pineapple and mango slices. I had something with a biscuit base and a deep coconut cream layer topped with a fresh strawberry. I did not try the coconut juice jelly. My episode with a terrible tummy upset three weeks previous remained fresh in my mind when selecting food. As we sat down with our dinner plates a New Zealand concert group took the stage. I did not realise this was the beginning of the show since they were unannounced and was disappointed it was the only time they appeared. They did a good job of short and long poi and stick, (long sticks), dances and a haka. Not long after the Compére began the proceedings and the non-stop show was truly underway. I videoed most of it but since we were quite a way back from the stage there were many heads in the way. John thought the Fire Dancer from Tonga made the whole thing worthwhile. The jury is still out as far as I'm concerned. There was some delightful hula and some great traditional dancing although all was modified greatly from the traditional forms, I am sure. 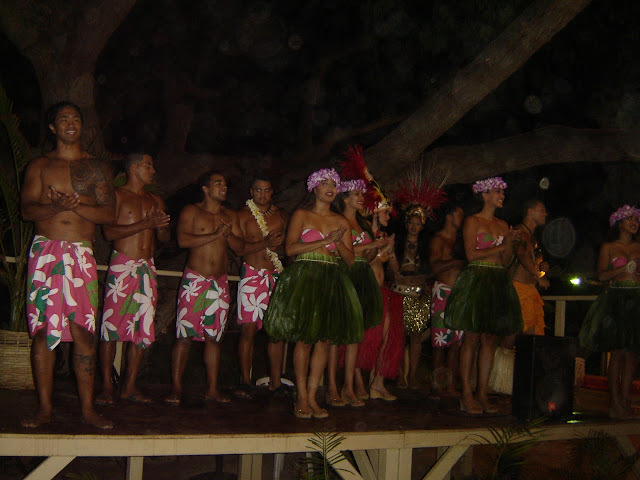 The same troupe danced the various island styles and had many dress changes. They were as professional and talented as you would expect. I still think we got a better deal at the free publicity show in the Prince Kuhio Plaza Mall in Hilo. I must have enjoyed it all in spite of some of my criticisms because it was over all to soon. We had time for one last drink and look around before climbing into our buses for the return to Waikiki. There was opportunity for photos with the performers and to collect autographs. But the real purpose was to give people another shopping opportunity. Can you see how cynical I am about touristy things? Of course I appreciate that this is the way most people in Hawaii make a living but it's not my style of seeing the world. Part of our tour package were the complimentary drink on arrival and two drink vouchers each. We headed to the not so crowded bar and John had a beer and I had a glass of wine. John was enjoying not driving while I was simply enjoying our last night in Hawaii. I spent hours editing our footage to make this video. It's still quite long at 7 minutes and there are a lot of heads in the way. Please leave a comment if you think I should split it into two or three segments. You read in books about velvety nights. I can say with all honesty, even if it sounds trite, that the night was black and soft like silky black velvet wrapped lightly around us. The moist warm air was pleasant and I enjoyed being out in it after the day-time heat of the tropical sun. We had gone out prepared for a cool evening in comparison with the day. It was pleasant, just right for spending hours under the stars. It was a nice to spend our last night. The atmosphere was casual and relaxed, we were ate traditional Hawaiian food, and were entertained by Polynesian style performers. What more could we ask for? I wouldn't go to a similar show again but I will certainly want to see more local dancing and I'd love to learn to Hula, something I never expected to say. It is a beautiful, graceful dance and I didn't think the hip movement was particularly provocative although it can be as seen in the Wedding Hula. The foot work is secondary to the hands which tell the stories handed down through the generations. I'm sure we will return to Hawaii. 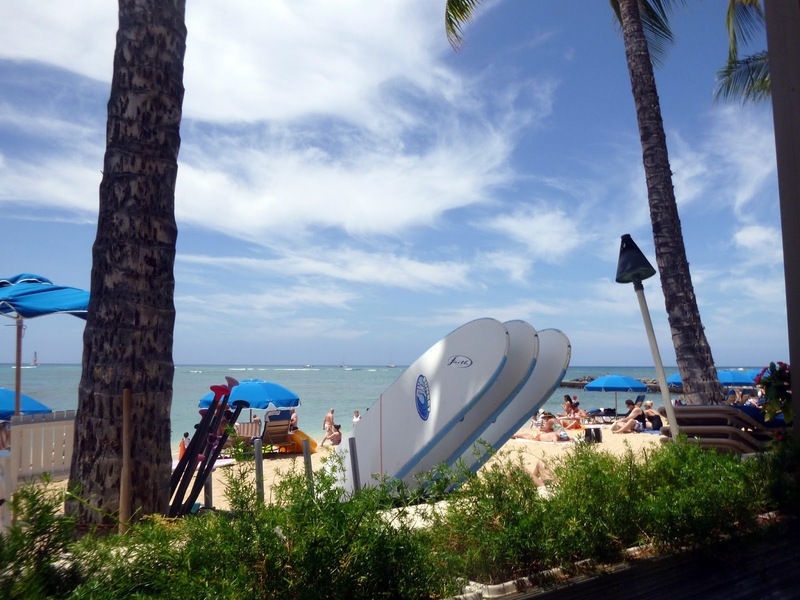 At present you can get deals for as little as NZ $1130 for return flights and 5 nights accommodation in Waikiki. Add a few more dollars and you can up-grade your hotel or stay a little longer. I'd look at staying outside Waikiki next time. Every moment and every dollar was worth the experience even if we did dip seriously into savings that were not meant to be touched. 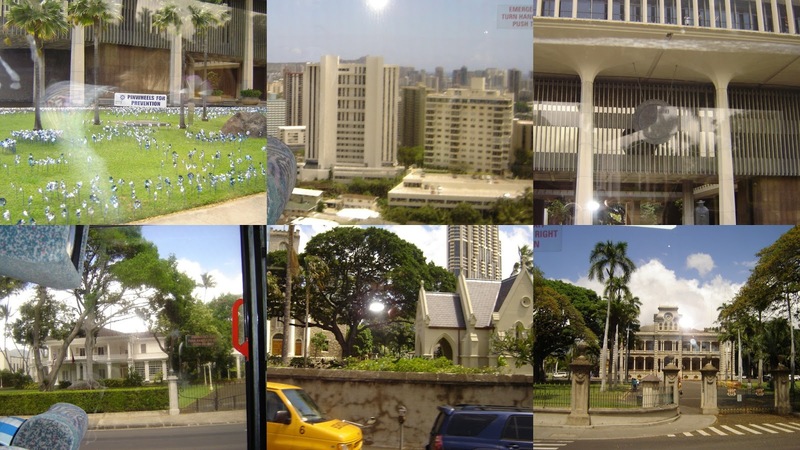 O'ahu is the third largest Island in Hawaii and Honolulu, On the south-west coast, is the State Capital. 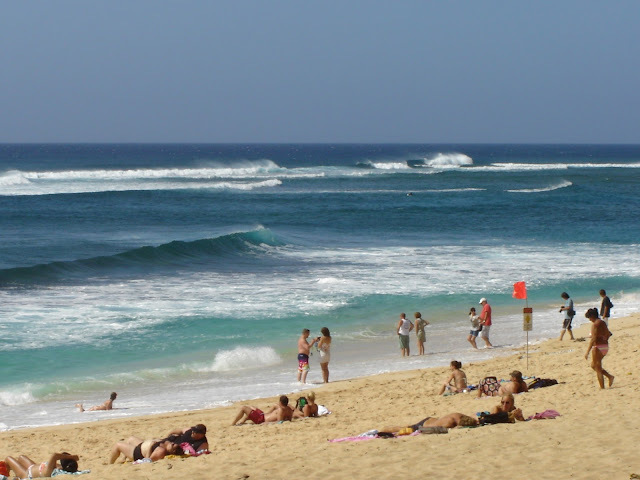 O'ahu Island is 44 miles (71 km) long and 30 miles (48 km) across. The length of the shoreline is 227 miles (365 km). That all means it is not a very big island and can be circumnavigated easily in a day tour but unless you are self drive you are unlikely to explore the north-west because the coastal road does not link up. Interestingly the population of Honolulu is less than a million people leaving about 400,000 spread around the rest of the island there is plenty of empty space once outside the city area. It's no big surprise that tourism is the number one industry and I worked out that about 22,000 tourists arrive daily in Hawaii. Those are mind blowing numbers, especially when you consider this is a continuously growing number. 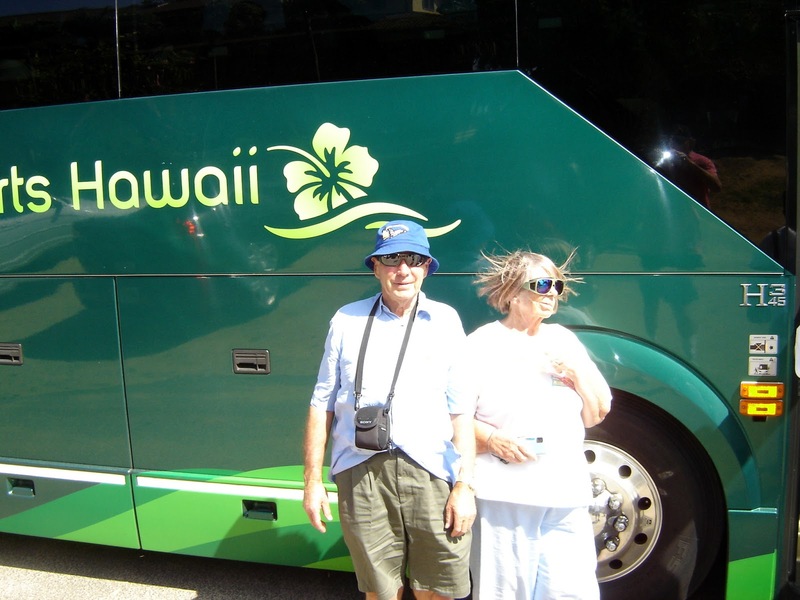 We are aware that Hawaii is becoming a destination for New Zealanders and Australians. There are also increasing numbers coming form the United States mainland. The number of cruise ships is increasing too and I guess this large number reflects that. I cannot imagine living anywhere with so many new arrivals day by day. I do know what it feels like to have a small population expand at holiday time but that is over in a month or two and we are back to our nice relaxed normal numbers. 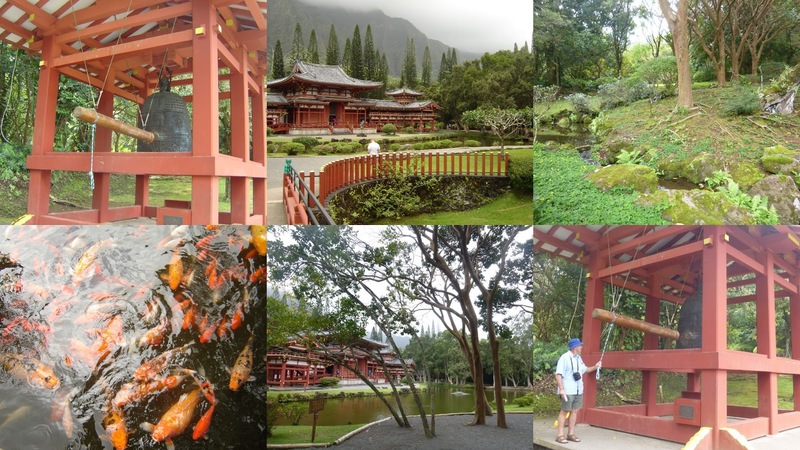 I wanted to see more of O'ahu than Honolulu and the best way was to book a bus tour. It was another early start but I was beginning to appreciate that as the day progressed Honolulu usually became a little too warm and humid for my comfort. We had coffee, crackers and avocado in our room knowing it could be quite a while before we ate again. We were out of our hotel and across the street waiting at the bus stop by 7.20 am. We were the second party on so got seats one back from the front which is always good as it’s easier to interact with the driver/guide. This was was a hoot and we had a lot of fun which was helped along by some friends from Maryland, who just happened to be African Americans with a great sense of humour. There was a lot of laughter and some really funny jokes. Our first stop was at a lookout over a beautiful beach which costs $7.50 per person to enter. We looked down from a cliff. It felt really weird as though we were voyeurs staring at the rich and famous. Had we been self drive we could have gone down to the beach after paying but you had to be there very early. Security was closing the entrance and it was not yet 9 am. It’s famous as a movie location, especially Blue Hawaii with Elvis Presley. Next stop was a blow-hole but nothing to see because there were no waves. 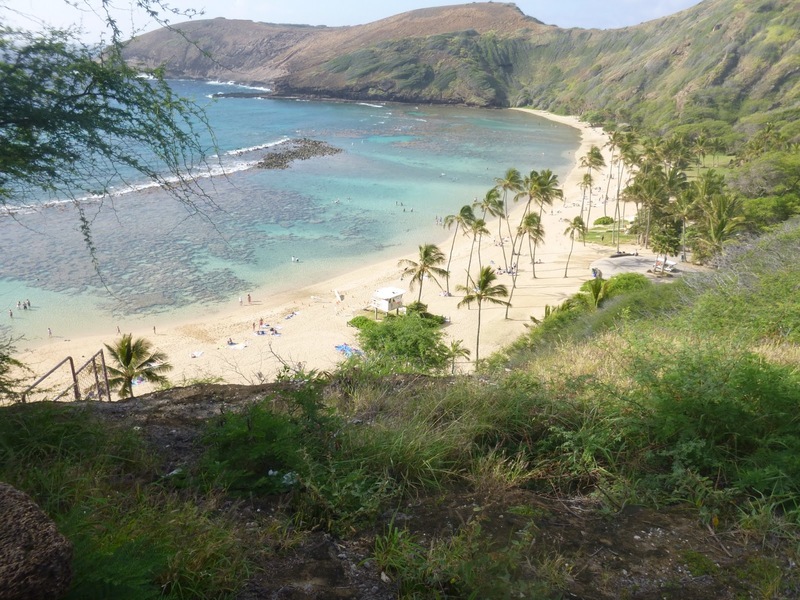 This park overlooked a beautiful sandy beach where President Obama has surfed and on the other side the tiny beach from the love scene with Deborah Kerr and Burt Lancaster in From Here To Eternity. It’s rugged land and great for hiking. Third stop was the Coral Factory with lots of lovely jewellery. I had to not look too hard because to be honest I have over spent. We did have a complimentary cup of coffee which was very welcome. I'm going to dream about buying a piece of coral jewellery until we go back. Fourth stop was an overlook taking in Rabbit an Turtle Islands. It would have been spectacular but vlog had combined with a damp mistiness and closed in. There was a wind from the south bringing vlog, volcanic smoke/steam, from the Big Island volcanoes. Where ever we went there was a haze and since this lookout was fairly high up the mountain, over 4000 feet, drizzly rain turned to thick mist. A walk in the bush would have been nice but I was cold. Now that was a change and I did not have a jacket of any kind. Fifth stop was a Japanese Buddist Temple built in the early 1900s as a replica of 900 year old temple in Japan. John rang the bell which is supposed to bring good luck. The stream was full of well fed carp and the grounds were pleasantly peaceful if you could get a moment free from the crowds. 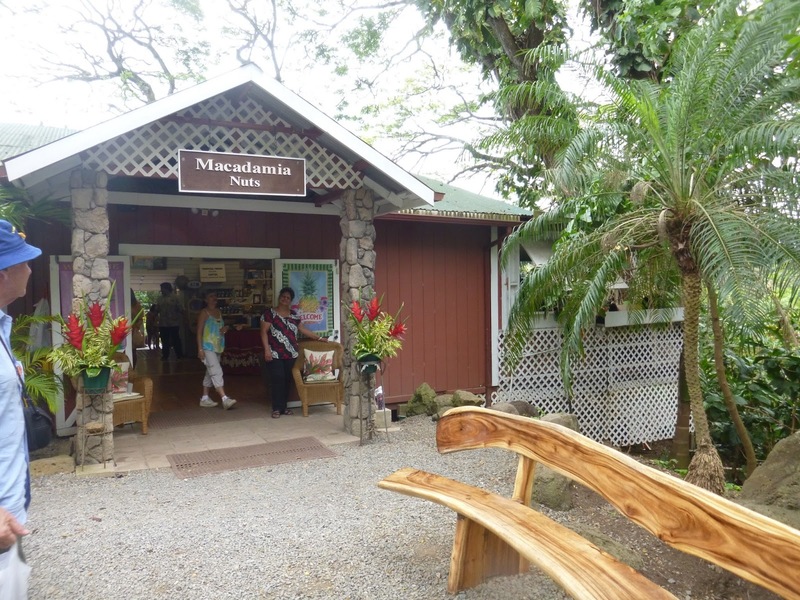 6th stop Macadamia Farm outlet where we bought some Noni lotion. Some for John’s shoulder and another skin lotion which is supposed to clear up psoriasis. I’ve heard about this product in my various research so will be interesting to see if it makes a difference. 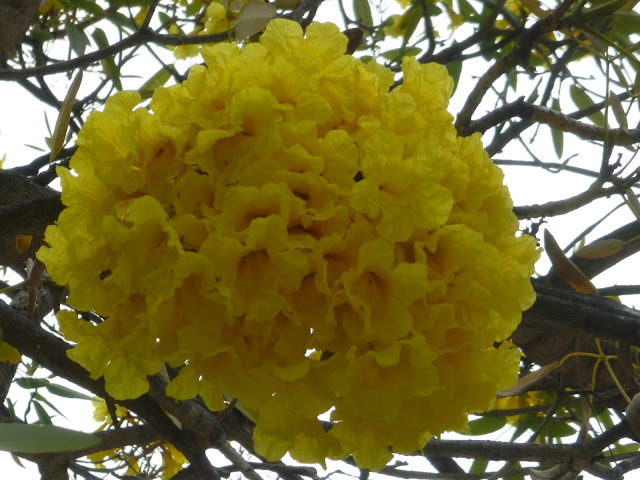 Noni has several names, one is beach mulberry and another is cheese fruit. Our bus driver let us know that he does not allow the fruit to be brought onto his bus because it smells like strong blue cheese and lingers. I think I saw it growing wild on the lava rock at Kalapana. They had complimentary coffee and macadamia nut tasting. It was very welcome although our driver kept reminding us it was a tasting, not a feast. Many of us needed this caution because it was now after mid-day. Lunch was at our next stop. We were running late, having been held up by roadworks. I really liked the kona flavoured nuts but the smallest bag they sold was 8 oz/230 gm and I didn’t think we would eat that many before arriving in New Zealand and I doubt they would go through customs without being confiscated. 7th stop Ranch where we had lunch. We had prepaid for a buffet and I was disappointed although we got enough to eat and it was reasonably tasty. We both had our choice of salads and slices of pineapple, back ribs and smokey chicken. This was totally geared up for tourists and they were promoting their different ranch activities. The tram tour with a commentary on the history of the ranch felt like a throw in but it was interesting if too brief. READY TO GET BACK ON THE BUS AT SUNSET BEACH HILARIOUS! 9th and last stop was at the Dole Plantation and now I know why I do not like dole pineapple very much. Australian is far superior. 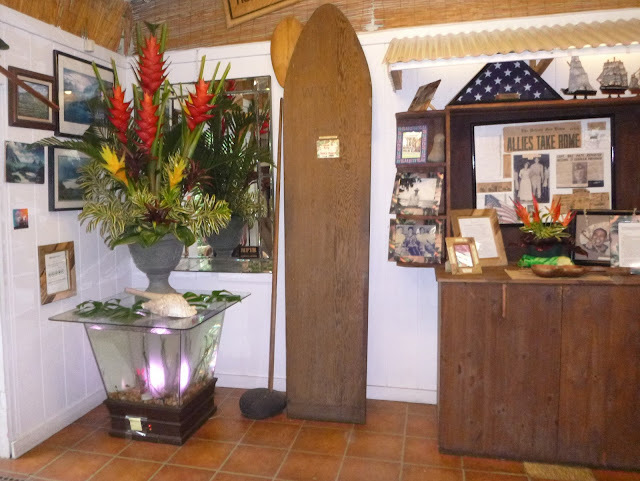 Mr. Dole started the business way, way back and it was a major industry in Hawaii. Unfortunately they went out of business because of the lower cost of production in Phillipines and now I think all Dole pineapple comes from Thailand. Pineapples are still grown here. 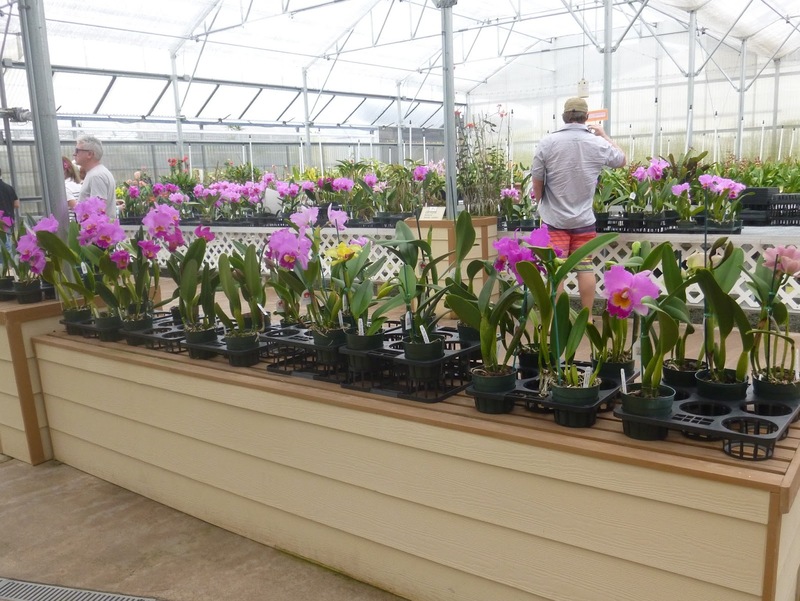 I must write more about Hawaii’s agriculture when I have time. The place where we stopped was a great example of diversification taking advantage of the tourist industry. I had to try a pineapple whip here and it was delicious. It tasted like pure pineapple juice in a soft serve icecream. 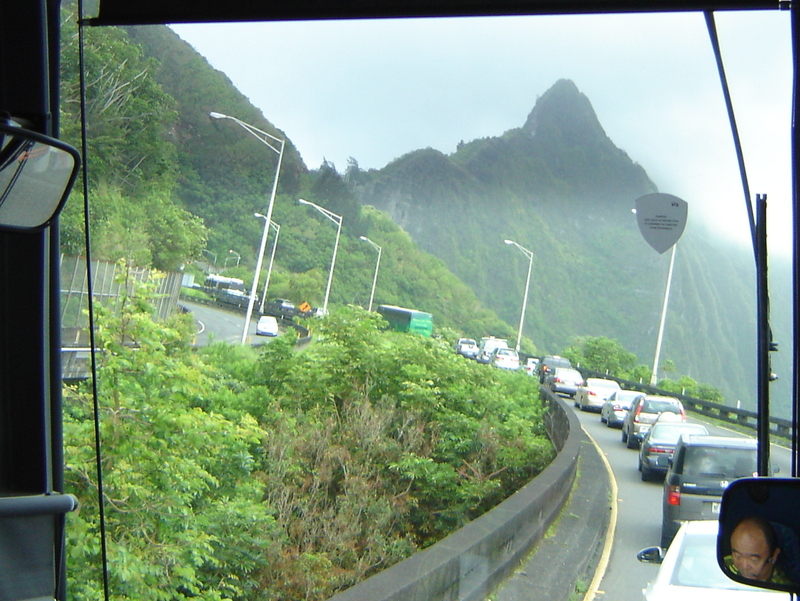 Our tour was completed as we drove by more military bases, Wheeler Airfield, Pearl Harbour, the pink landmark building of Tripler Medical Centre. The drop offs began at the Ala Moana Mall. We were dropped off exactly opposite our hotel at about 5 pm. We went to the laundry and washed everything I could think of. I dislike packing dirty clothes plus I made a good job of spilling drinks and food on myself today. Pink coloured juice at the Coral Factory and my pineapple whip dripped all over in the heat. We were done for the day and were glad the hotel restaurant was only an elevator away. Tomorrow we will take it easy in the morning. Our pick up for the tour to Paradise Cove where there is a Polynesian show and a Lu'au, (dinner), is not until 4 pm. 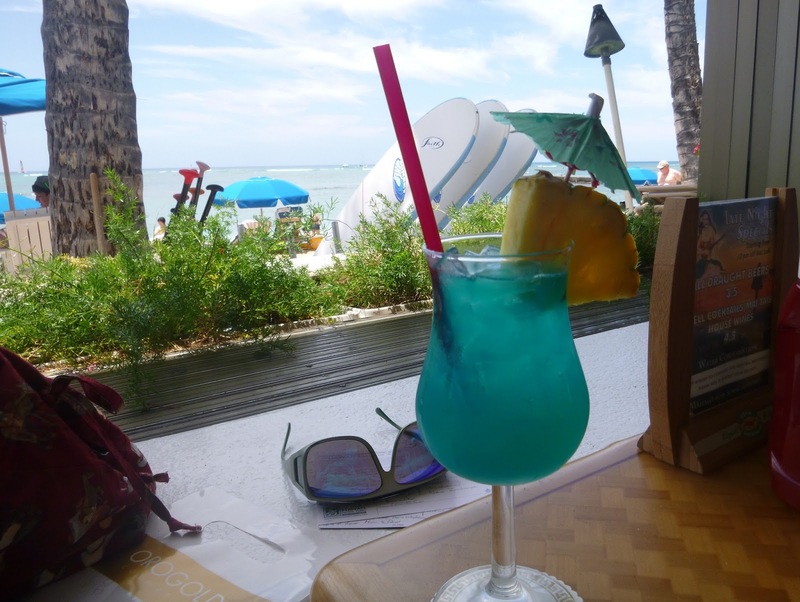 This is the day I will try a Blue Hawaiian cocktail for Sharron, our son’s sister-in-law. I have to admit that this kind of touristy life is not for me. I can handle it for a few days but I could NEVER handle a full time tour. 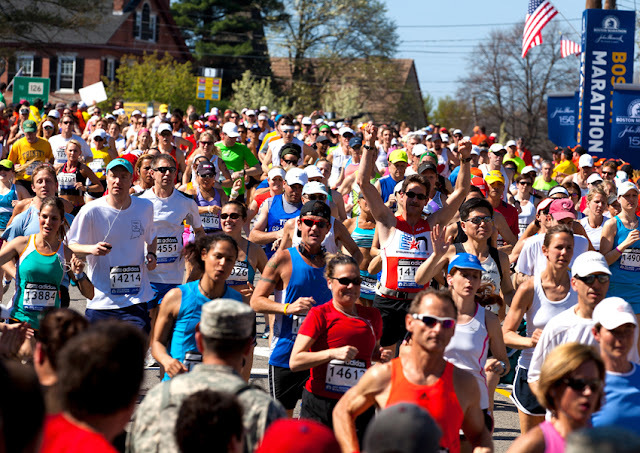 I could not mention our shock and grief over the bombing at the Boston Marathon until now. Our hearts go out to all who lost family and were injured. We can only imagine the shock of people caught up in such a terrible thing. New Zealander Alison Roe, a world class marathon runner, described her feelings of unreality on our National News. She said the Boston Marathon had lost it's innocence. I was directed to this blog post by Levonne whose writing I have enjoyed for a few years now. The runner is the son of a friend of Levonne's. How amazing is the internet that we can hear first hand from people we would never normally have contact with. I hope you will take the time to read what this young man has written so well. 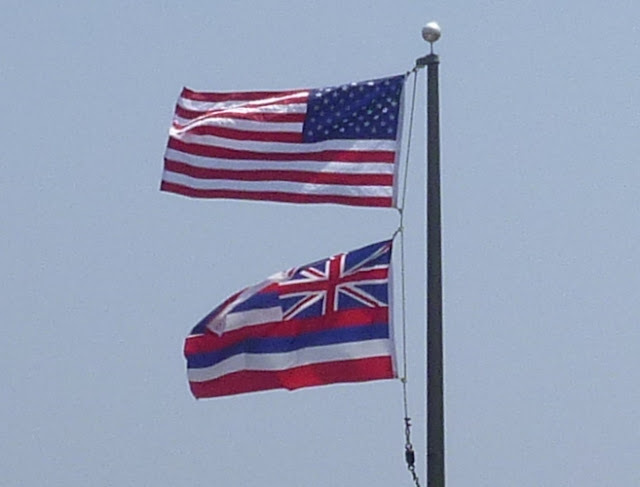 This act of terrorism came hard on the heals of our time in Hawaii. Last week we visited the Memorials at Pearl Harbour. Our hearts were still raw from the emotional impact of that visit. This page is dedicated to all the ordinary people who go about living their lives quietly yet with courage to face the terrible when called for. 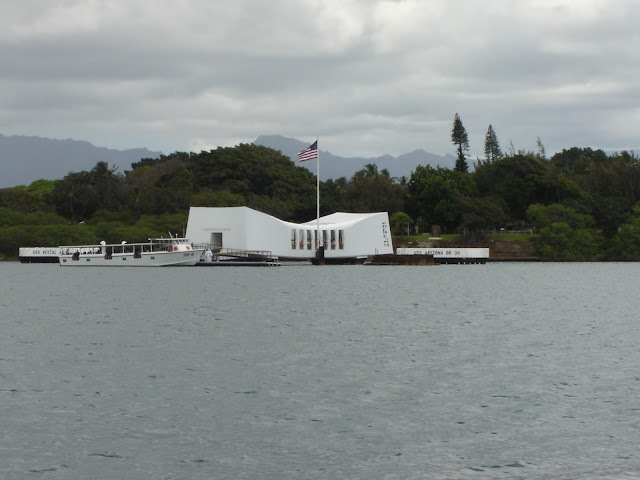 Our tour of Pearl Harbour was paid for before we left New Zealand. It was good to have no worries about buying tickets and getting there on time. This was our only prepaid tour/activity in the whole four weeks. I cannot recommend pre-paid tours but sometimes they are the least stressful, best way to go, and we did appreciate having a knowledgeable guide. We both remember the years of WW 2 which had a profound effect on our lives though we were very young children. John’s father was away for more than 4 years in Egypt and Italy. I was four months old when war broke out, 6 years later I remember VE Day, (victory in Europe) and VJ Day, (Japanese surrender) and September 1945. Our lives revolved around war news, family members overseas in the armed forces and the fear of invasion. New Zealanders acknowledge the huge debt we owe America for keeping our part of the Pacific safe even if it took the great tragedy of Pearl Harbour to fully activate their might. Sadly this tour is overwhelmingly touristy. More than 4500 people are ferried to the Arizona Memorial on any single day. It’s not that the solemnity and sacredness is spoiled but the sheer number of people who visit make it almost impossible to spend a few moments in quiet reflection. There are other places for that such as the National Memorial Cemetery Of The Pacific with it’s quiet green lawns, shaded trees, and thousands of graves and plaques laid out in the grass. This place is higher up the mountain in the punchbowl, therefore cooler and uncrowded since tour buses do not stop, they are only allowed to drive through. Our tour bus driver was also our guide and looked after us well. We appreciated him and he did well keeping us ahead of the biggest crowds. 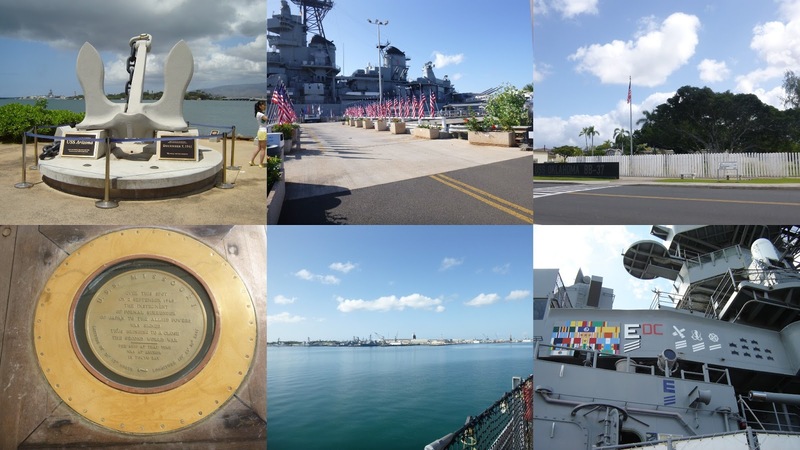 Pearl Harbour is an active Naval Base and the visitor area is also under tight security. We had been warned in advance not to take bags. My handbag was put in a locker immediately we arrived on the base. We carried our small water bottles, and in our pockets tissues, passports and wallet. This is also a National Park with co-operation between the Navy and Rangers so I was able to get another stamp in our National Park passport book. For the rest, let the pictures tell the story. I found it emotional and had to switch off my thoughts many times before I ended up a weeping mess. The memorial to the Oklahoma with a white picket for each life lost: Driving past the airfield where the planes were lined up like sitting ducks on that awful day, 7th December 1941: Seeing the Arizona still leaking oil under the beautiful memorial: Looking across to the tiny hospital where they tried to turn chaos and brokenness into some kind of order: Standing on the deck of the battleship Missouri where the formal ceremony of the Japanese surrender was signed. We had seen old news reels, we’ve seen the movies made and now we’ve stood on hallowed ground. Thank-you Hawaii and thank-you America for preserving this part of world history as sensitively as possible. 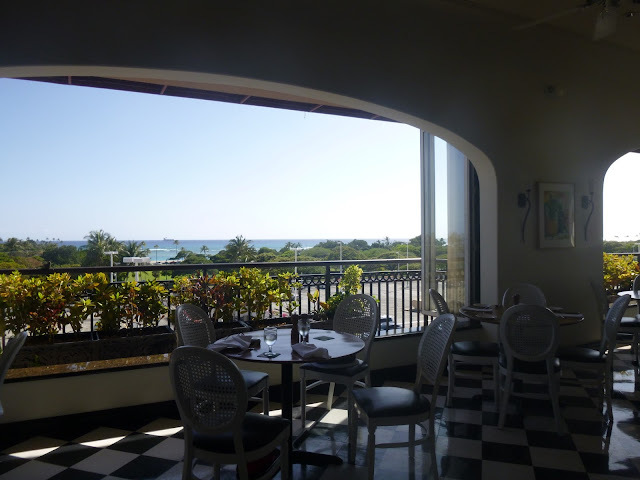 We got off the bus at the Ala Moana Shopping Centre and went up to Longi’s Restaurant for a late lunch. It was lovely relaxing over a meal with a view out over the Ala Moana Park to the sea. I had an antipasto salad and John had something with clams which looked light and delicious. Then we went and ruined it all when I ordered dessert. We shared a wedge of coconut pie and another of strawberry shortcake. Both were light and delicious. Neither was food we needed. We ate for the pleasure of eating something decadent and delicious. This time I looked in Sears and Macys and a top end outlet shop. In the finish I went back to Sears who are having a closing down sale, ….. I wonder where they will go after this, and bought 3 pairs of pants. I’m kind of wishing I’d bought something classy in the outlet mall but I was put off by their prices. 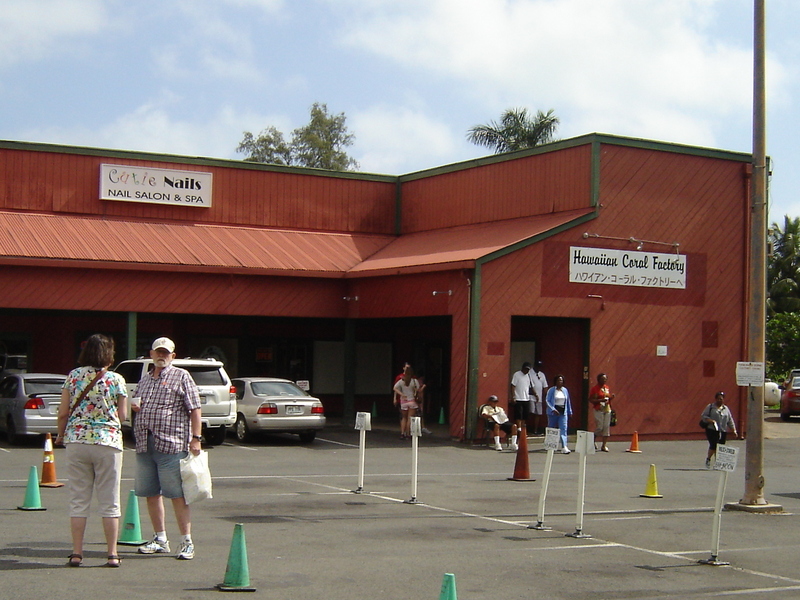 It was definitely easier to shop in Hilo than here in Honolulu. Somehow we were hungry enough to eat again by evening so we went to the Steak House at our hotel about 9.30 pm and ate again. I am finding the humidity and heat difficult. I am right on the border of being able to cope and still do things. My feet are very swollen. I might need to see if there is a pharmacy which has an over-the-counter diuretic. The temperatures are not really too high especially out of direct sun so it must be the humidity. I’m trying to keep my feet up while I write. 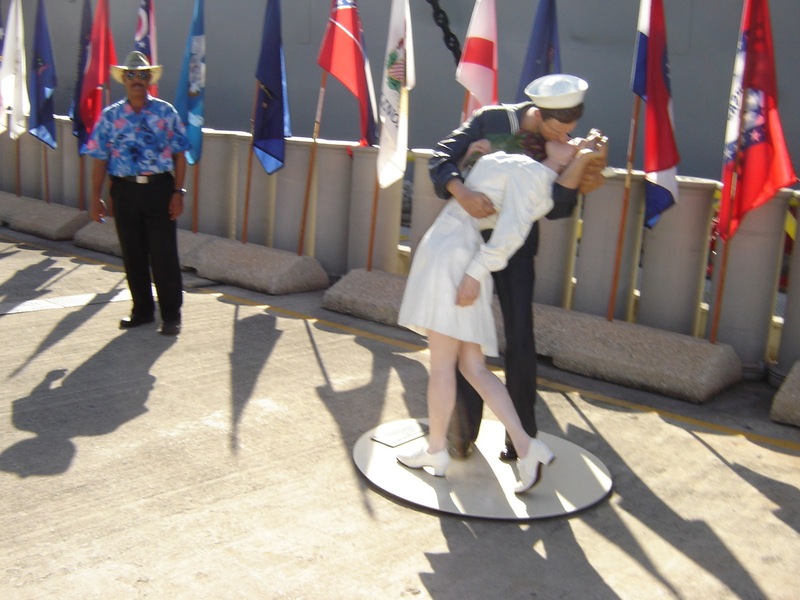 I would go to Pearl Harbour again but not on a tour bus. That was right for us his time but with better information and the tour experience behind us we would have a better time as independent visitors next time. There was a lot more to see and experience than we realised. Yesterday, after getting settled into our hotel and going for a walk, we ate at the Steak House adjacent to the hotel. It is part of the hotel complex but seems to be run independently. I felt daring and decided to have a dessert. Now there was the normal dessert menu and then there was the decadent menu. At least that's how I read it. I chose something from the decadent menu which turned out to be some kind of deliciously creamy cocktail. Of course we were sharing so not too much damage done. It doesn’t feel like Sunday here. The days are all running into each other. We were out in the hotel lobby by 7.20 am waiting for the shuttle to our breakfast restaurant at the Mirimar Hotel. For a free breakfast it was OK with nicely scrambled eggs, sausage links, pancakes and coffee. I did eat one pancake because they looked delicious and I was hungry. We spent most of the morning listening to a man advertising the tours available and then we had to confirm our Pearl Harbour trip. 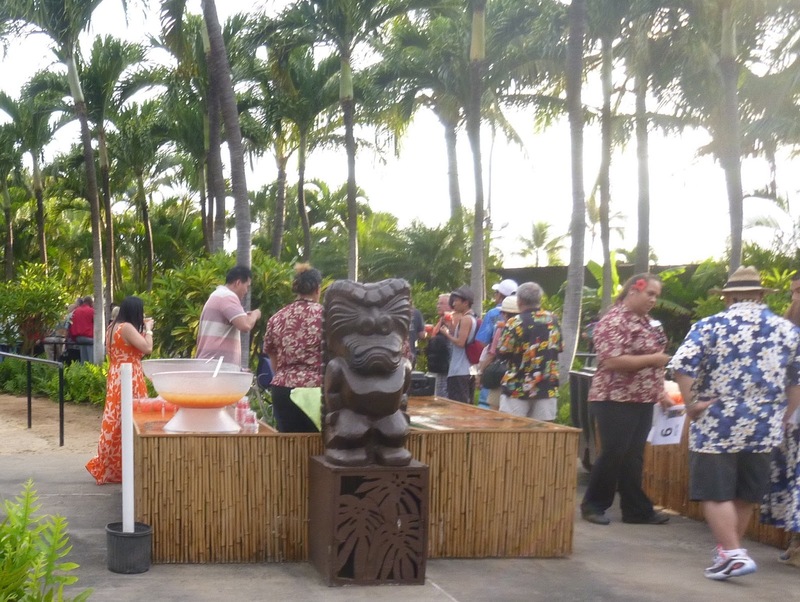 What a lot of wasted time for a free breakfast and photos with leis that were promptly removed from us and put on the next person. I guess one has to be a tourist to do things like this. Once this part of the show was over we were taken by shuttle to the Maui Divers Factory where we got a potted and rushed through version of their history and bustled into the shop. It was easy to just look as the prices were way out of our league but the jewellery was Oh so beautiful! 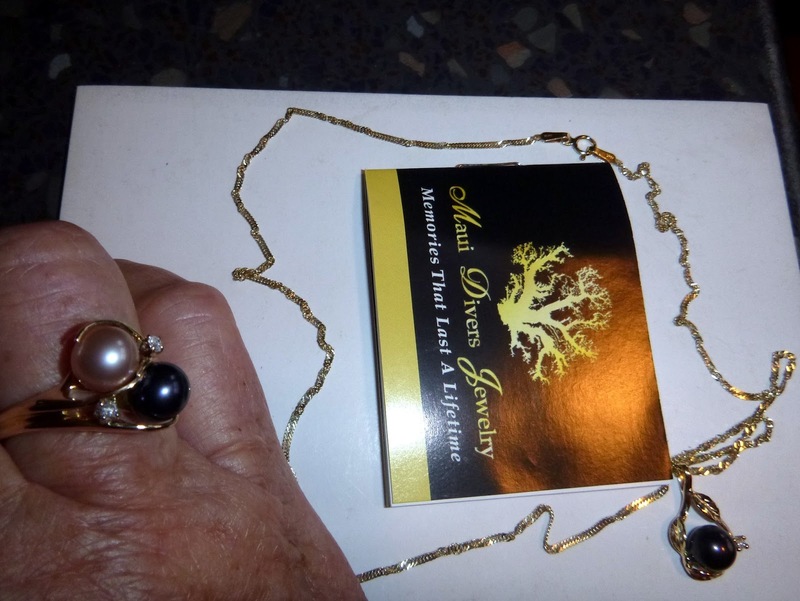 I had a not so secret longing for a black pearl ring and John was rushing me by. The way out was through the ‘Factory,” where we were encouraged to choose an oyster and the pearl would be ours. Of course this pearl needed a setting and I caved in and John gave up. I am now the owner/wearer of a beautiful pearl ring with not one black pearl but a second pink tinged pearl. We ended up with three pearls so of course I needed a pendant and chain too. I'm not proud of myself but they are lovely. I won but the bank balance looks a little sick. Following this extravagance we waited for the shuttle which took us to Hilo Hattie’s flagship shop in Hawaii. The layout is the same as the one in Hilo, Big Island, just more of it, and we were treated to free chilled juice and coffee while we admired the largest shirt in the world. You wouldn’t want to fit this 400xl shirt but it made a great wall covering. Inside we found a café and our food choices were poor. John chose a hot dog plate so he could discard the bun while I had a bowl of chilli which was mostly rice, which I left, but the coffee was good. We shopped around a little and I bought myself a pretty dress and cardigan. 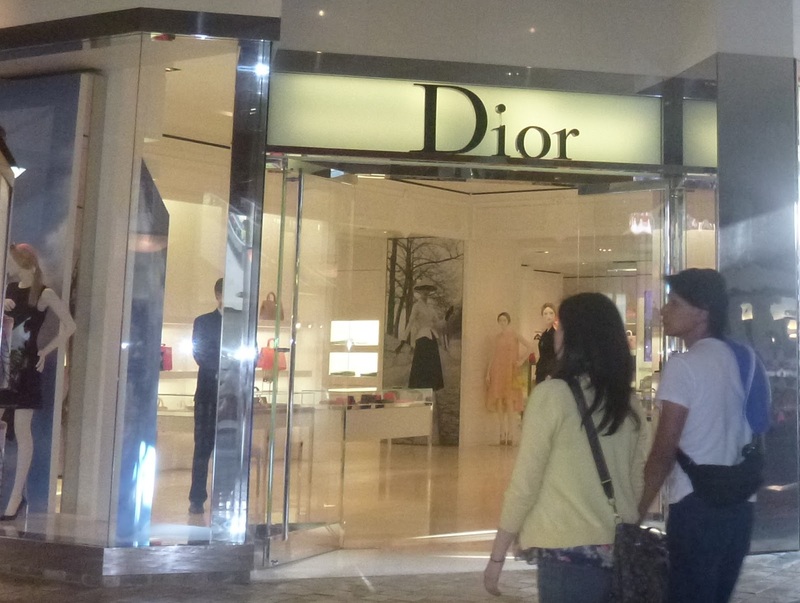 Our next stop was the Ala Moana Mall with it’s 290 odd shops. I was really drooping. We are not always getting enough protein to eat so our first stop was the Makai Market Food Court, which was overwhelming at first glance, with a huge variety of places to choose from. I found a place serving BBQ beef. A plate of meat and vegetables was just what I needed. We were on a mission. I wanted/needed some new jeans or capris since all the ones I have are too big and baggy. I saw a maybe in Sears and nothing in Macy’s. I am not a person who really likes shopping. I know what I want, usually, but I do have favourite shops and when that doesn’t work I’m in trouble. In spite of air-conditioning my brain was frazzled. We did allow ourselves a fun chat with another street/mall hawker. This one was very smart and gave us vouchers for another free breakfast, this time definitely more up-market than today’s, in return we will listen to a time share presentation. Before leaving the Mall we had an icy fruit drink something between a smoothie and a slushy. It was dark when we caught our shuttle back to our hotel and that last short walk seemed extra long. It deserved a cold drink. John had a beer and the nice barman made me an alcohol free cocktail. I could go for this life full time. We were glad to end our day and go to bed early but not before another shopping spree to an ABC store, they are everywhere, nearly every corner it seems, for water and something to mash our avacados in. We picked a couple of avocados off the ground and some oranges before leaving the coffee plantation. Our hotel room has a fridge and coffee maker, no plates and only paper mugs. EASTER SUNDAY IN HILO, HI.